Thirteen years ago, a guy named Jawed Karim posted the first-ever YouTube video. YouTube now has more than 4 million videos. Moreover, by 2019, 80% of global Internet consumption will be video content. That means that you cannot ignore your YouTube channel and lose traffic. Moreover, your video can conquer the TOP positions. If you are starting your YouTube channel or have been already engaged in video marketing, you can’t avoid dealing with keywords especially if you want to get high rankings and more views. Let’s go through simple, useful, free tools to get the best keywords for your social media video. You can collect the needed keywords in SE Ranking using its internal database and search suggestions for Google, Yahoo, and Bing. Just indicate the language, country, and region that you need. With SE Ranking, you can get a good set of short-tail and long-tail keywords that are filtered by popularity with detailed statistics on keywords: KEI (keyword efficiency index), monthly search volume, suggested bid (the average price in USD, predicted by Google Keyword Planner) and the number of search results. Consider YouTube autotranslation: if you plan to promote your videos in specific regions (for example, Germany, Italy), make sure that the automatic translation into the appropriate languages won’t change your keywords beyond recognition, and you won’t lose the search volume. 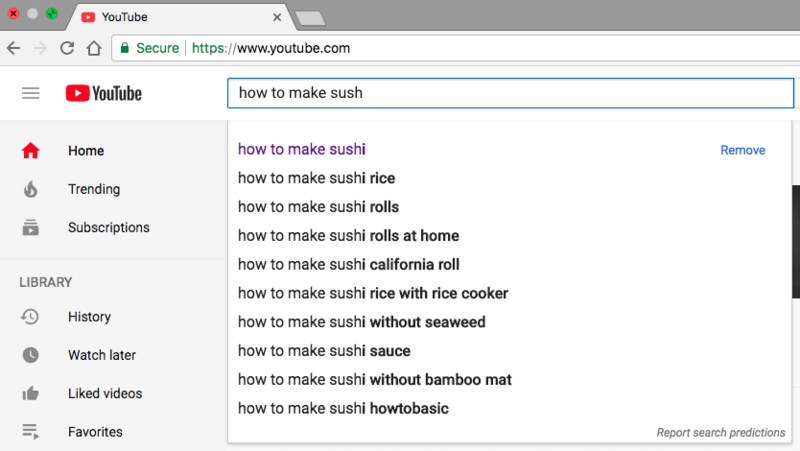 Enter a needed query in the search box, and you’ll get a list of predictions from the most popular queries among YouTube users. If you want to get queries that end with the keyword you need, add a lower dash and space before it. Firstly, you will see the most popular videos on YouTube and get a bunch of ideas for your future content plan. To maintain the experimental integrity, search for predictions using the Incognito mode or special services like SEO Global For Google Search plugin for Google Chrome. This popular tool allows tracking the popularity of search queries in YouTube. How to do it? Enter your keyword, click on “Web Search”, select “YouTube Search” and voila! You will receive valuable information about the growing or falling popularity of the search query. By tracking the query popularity in a particular region, you can see peaks and slumps. This way, you will determine the keyword seasonality. It’s your chance to get prepared for active promotion in advance or save your budget when it’s not the time. Also, you can compare two search queries and determine the most relevant (popular) one. TubeBuddy is a browser plugin that helps you to find out how your competitors promote their videos and which keywords they use. Start from installing this plugin (available on the TubeBuddy website). To access your personal page, sign up for your Google+ account. After you add your channel, you can go to the “Competitors” section, then press “Manage” and “Add Competitor”. Then add a link to your competitor. After that, your competitor’s channel will be displayed in the “Competitors” section. Click on it to go to this channel right on YouTube. Press the Channelytics button to view the analytics. 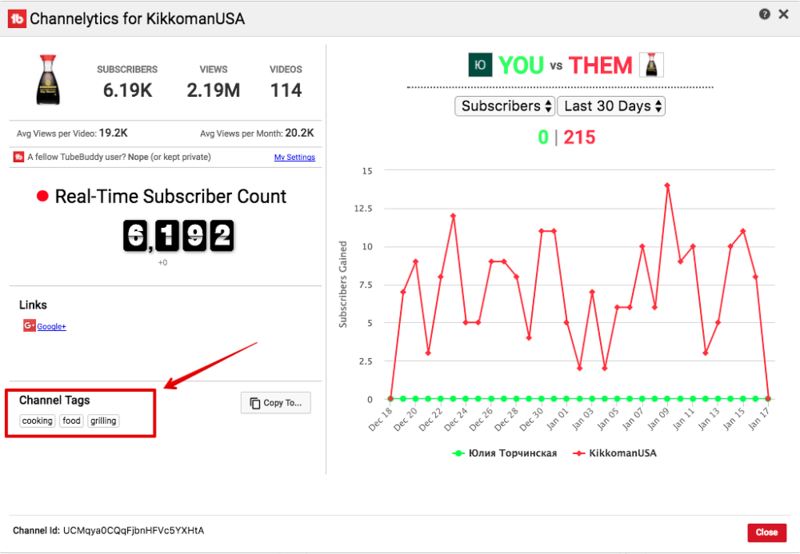 Moreover, you can find out the number of competitors’ subscribers, views, videos, and see the channel tags. But that’s not all – you can compare your own and competitor’s channels by various parameters. By monitoring your competitors’ channels, you can find out their YouTube promotion hacks, analyze their primary keywords and improve your strategy. So, you’ve already collected keywords for your videos. What next? Put your keywords at the beginning of the title and include them in the description among the first 25 words. The video’s title shouldn’t exceed 100 characters, and the description – 5000 characters. Remember that users will see only the first two lines of the description in the search, so include the most important stuff at the beginning. Also, don’t forget about tags – pick up to 10 tags for each video and make sure to include at least one keyword there. You are almost ready for the YouTube promotion. Just a few general tips for optimizing your channel, allow comments to your videos so the users can ask questions or share their opinions – this is a positive ranking factor for the search engines, check your videos’ rankings. In SE Ranking, you can track the video rankings on YouTube and monitor which one is ranked better. In this case, monitor the rankings of each video separately, rather than the channel’s rankings. Pay close attention to the first 15 seconds of every video – that’s when viewers are most likely to drop off (according to YouTube). Create playlists by grouping your videos, for example, how to prepare smth, how to choose ingredients, lifehacks, etc. This way you can keep the user on the channel and make the navigation easier. Add a link to your other videos, playlists and the channel at the end of the videos using the end screens or in the video description. This will increase the number of views and subscribers. YouTube video promotion is not only about picking keywords and adding them to the description; it’s about your constant work. Your content should be mature, exciting and “regular” – try to post videos regularly, reply to all comments and reveal new topics. And make sure to share new videos on social networks and remind users to subscribe to your channel.